The scientific understandings that should determine the speed and depth of our response are missing in action, as if policy makers assume they can negotiate with the laws of physics and chemistry, free of consequence. Whilst the Greens have always stressed the scientific and moral imperatives to act, Labor seems reluctant to do so. Climate safety, and the individual and social responsibility to protect and nurture current and future generations, and the world on which they depend, would seem to be values Labor could successfully communicate. But it has not done so. Labor says it wants to promote community understanding about climate science and impacts and has established a group headed by Tim Flannery for that purpose. But will the message be politically mediated, a marketing tool for the government? The Flannery committee must confront the increasing dissonance between science and politics at the core of climate policy making. It is also a challenge for the Garnaut Review, with “The science of climate change” update to be released on Thursday in Hobart. For two decades there has been a convenient consensus that global warming of up to 2 degrees would avoid dangerous climate change, without peered-review literature to support this assertion. Now that consensus has been broken, as events and new research identify a safe boundary of less than 1 degree, while global political inertia means we are heading towards 4 degrees. Oceans acidifying 10 times faster today than 55 million years ago, when a mass extinction of marine species occurred; whilst the Royal Society communicates “very strong indications that the current rate of species extinctions far exceeds anything in the fossil record”. New analysis that sea levels may rise three times faster than IPCC estimated. 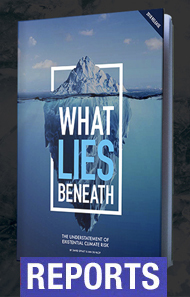 It is little wonder that research now identifies 2 degrees as “the threshold between dangerous and extremely dangerous climate change”, and a “safe boundary” as being under 1 degree of warming. At the current warming of 0.8 degrees above pre-industrial levels, NASA climate science chief James Hansen finds there is little or no “cushion” left to avoid tipping points in the climate system, and that Labor’s 2 degree target is a “recipe for disaster”. Yet if all the current international commitments to reduce emissions are realised, global warming by 2100 will be around 4 degrees, but may be reached as early as 2060 if we stay on the current high-emissions path. The impacts of 4 degrees are almost unimaginable, with the earth’s population carrying capacity likely reduced to below 1 billion people. 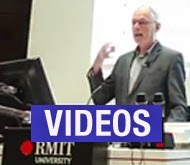 While Australia’s Office of National Assessment recognises the reality of 4 degrees, and some policy makers suffer the delusion of reasonable adaptation to a 4 degree-warmer world, neither the government nor the coalition acknowledge that 4 degrees is our current destination. This is the dissonance that the Flannery committee faces. How can it communicate the science honestly, whilst not making the currently legislative proposal seem but a bucket in the ocean? The government’s (maximum) position of a reduction in emissions compared to 1990 levels of 25% isn’t in the ballpark. Indeed, if equal per-capita rights to emit carbon pollution were granted to all the world’s citizens, even a 2 degree target means that the carbon budget for high per-capita emitters of the developed would expire in less than a decade because “industrialised nations face CO2 insolvency”. 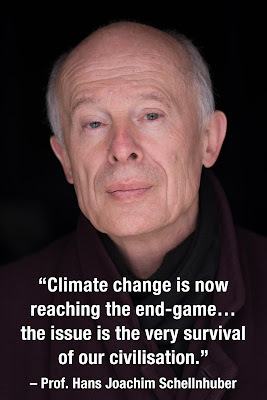 That analysis belongs to Hans Joachim Schellnhuber, perhaps Europe’s most eminent climate researcher, who says that “political reality must be grounded in physical reality or it’s completely useless”. From that standpoint, Australia’s proposed carbon price, which aims for a 5% reduction in carbon emissions by 2020, is pathetic. Without underestimating the political consequences of a successful legislative effort, we face the possibility of winning the carbon price battle, but losing the war for a safe climate. Last week business commentator Alan Kohler declared climate change “a national emergency” but few people on the hill, or on Collins Street, appear to be listening.